Our 16,000 square foot powder coating facility includes a fully automated conveyorized line that is equipped with the latest in current technology to quickly move your project from assembly to coating. To increase our efficiency and reduce lead times, the line was designed to accommodate a base and top coat in a single line cycle. Superior Steel Fabrication realizes that a good finish starts with an effective pre-treatment process. 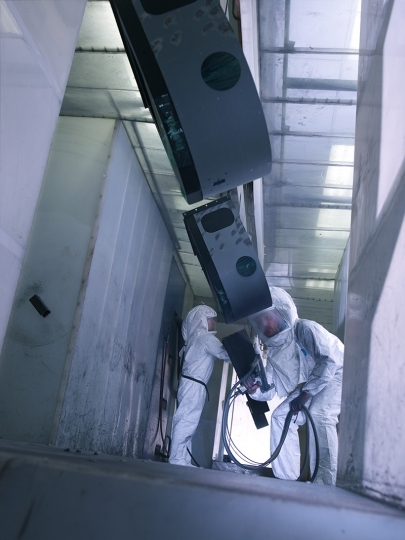 Our customers expect and demand a sustainable and consistent powder coat finish that is able to handle the most challenging environments while meeting the highest quality standards. All stages of our pre-treatment are monitored, controlled, and documented using SPC control methods. Records are kept on file for review. Whether you require salt spray tests, CIELAB measurements, or ASTM destructive/nondestructive tests, we can deliver.